The Super Sekrit Project REVEALED! I spent this last weekend at Rober-Con, a fairly new SF convention in Binghamton, NY--but not as just a con-goer. I was actually invited to be a guest author and presenter, and took part in four panels, as well as doing a book reading. I'm not going to lie--I had a blast. It was pretty cool to finally be a published fiction author out there in the world. My best pal Ellen and I drove (well, she drove, because I fall asleep behind the wheel after about 30 minutes, which is annoying as hell...especially to innocent bystanders), since it was only about an hour and 15 minutes from my house. We stayed overnight so we could go out to dinner with the con organizer and some of the other authors, and not have to make the drive back and forth. As with most cons, it was exciting and exhausting, and a few little things didn't go as smoothly as you'd like them to, but for an only-two-year-old con, it was amazingly well run. All my panels were well attended, and I had a wonderful time hanging out with the author Guest of Honor, Laura Anne Gilman. Laura Anne and I had never met before, but we had about a zillion author pals in common, which was nice. She was an editor before she became an author, and she knows more about the writing biz than just about anyone I have ever met. One of the great things about going to a con this close to home was that some of my Binghamton-area pals could come, including my friend Robin and her kids Sophie and Nate (my goddess-children), who had a blast at their first con. My friend Rob came too, only to feed me to author April Steenburgh's Bag of Death. It got poor Laura Anne, too. The con took place at the lovely (albeit confusing to get around in) Roberson Museum, which was filled with costumed folks, cool authors, and fabulous vendors. (Yes, I bought some used books--why do you ask?) I had a fabulous time, and plan to return in future years if they continue to invite me. But one of the BEST moments happened on the trip home, when my friend Ellen managed to surprise me (not easy to do when you're a psychic). We'd stopped in the museum's gift shop on our way in on the second day, and I spotted a cool blue stuffed dragon. I'd been sort of thinking of picking it up as both a memento of the con and as tribute to Chudo-Yudo, the dragon characters in my books. Alas, when I went back for it at the end of the day, it was gone. And they'd only had one. (I know, because as soon as I saw it was gone, I suddenly realized how much I'd wanted it--you know how that happens--and had the gift shop staff check their inventory. But nope, only one, and it had sold.) So I settled on a cute little black one instead. He IS cute, isn't he? I'm thinking I might have to have a contest to name him. So we're driving home, and stop so I can have a pitstop. And when I get back into the car, Ellen says in a mysterious voice, "You know, I think the Force has shifted in this car." Needless to say, I had no idea what she was talking about... And then she pulled a bag off of the top of this mound sitting between the two front seats, and there was THE BLUE DRAGON! He's going to need a name too. And now it looks like I have the beginnings of a collection. I don't normally collect things (although I have always liked dragons, and actually have a few already), but I believe I'm going to have to make an exception. In short, I had a fabulous weekend. I took today off to recover, but tomorrow, things go back to (coff) normal. In other words, I'll be writing. 11 A.M. Author Reading: Deborah Blake Susan Waters Room (second floor of mansion) Deborah Blake is the author of eight books on pagan practices (published through Llewellyn Books). 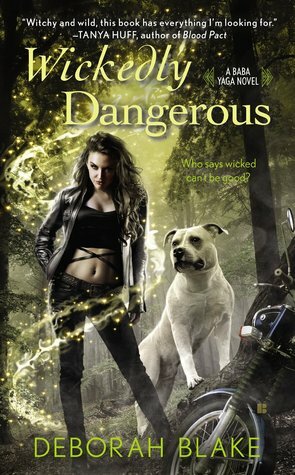 Her paranormal romance series, Baba Yaga, launched in September, with the release of Wickedly Dangerous. Lots of people come up with ideas for a story, but how do writers carry those to completion? We’ll talk with authors about the nitty-gritty of writing, from that first spark of an idea to seeing your idea in print and all the glamour and work in between. Many books and genre television and movies feature witchcraft, magic and myths from around the world. For some, this is just fiction. For others, it’s the reflection of a serious religious path. How much of what you read and watch is “true” and what makes most pagans laugh out loud in amusement? What are the rules of worldbuilding? What are some of our panelists’ favorite examples of worldbuilding done right? How much detail should you go into, and how do you make sure that the plot is central, and not the scenery? From Mary Shelley to J.K. Rowling, women have profoundly influenced SF and fantasy. Yet according to the book review statistics, we’re still overlooked — and many casual readers believe women only write certain kinds of stories. We’ll bust some myths and add to your “to-be-read” pile. I hope that if you're in the area, you'll come see me, and join in all the fun! And if you see me wandering around the con, be sure to come up and say hi. I've been teasing you all for a couple of months now by occasionally mentioning the Super Sekrit Project I've been working on--but I swear, it wasn't my fault. The thing about publishing is that you don't want to announce any project, no matter how certain it seems, until you have a contract. And the contract for this project was unusually complicated because there were two people involved. Go ahead, take a look. I'll wait. Do you have a guess what the project might be? Here's another hint: this project is for Llewellyn, but it is completely different from anything I have ever done before. NOW do you have a guess? I'm doing a TAROT DECK. I know! How cool is that? (Can you tell I'm a little excited?) I hadn't really planned to do anything else with Llewellyn, beyond the book I have coming out in March [Everyday Witchcraft, a follow-up to The Goddess is in the Details, which just went back for an 6th printing, by the way.]. I'm mostly focusing on the fiction for now. But when I got offered the chance to do a tarot deck, the project was just too fun and cool to say no to. And then they found Elisabeth to do the art, and I was even happier I'd said yes, because I really love her work. 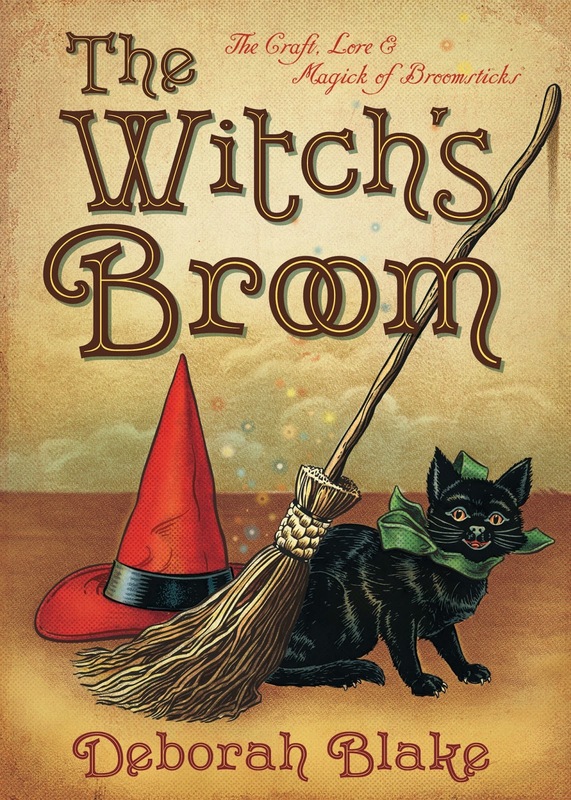 We don't know what it is going to be called, although we are using "Retro Tarot" as a working title, because the style is loosely based on the art for the front cover of The Witch's Broom. You remember that, right? We'll probably end up calling it something like "Everyday Witch Tarot" or "Practical Witch Tarot," because as usual, I'll be taking a simple, practical, and easily accessible approach. It is my job to come up with the theme, and the descriptions for all 78 cards (we are using the basic Rider-Waite tarot as a base to work from, since most people are familiar with those cards). And then write a 300 page book to go with the cards, which Elisabeth creates based on my descriptions. She's amazing, so I think this deck is going to be really something. I'm very excited to be working with Deborah on this tarot project over the next year and a half. Her writing and my art are meshing fantastically so far, and I can't wait to see what other cards await my pen and paintbrush! This will be a fun collaboration, and I'm very pleased and honored to be working on it with Deborah and everyone at Llewellyn. Underneath caption: You have everything you need and most of what you want. Life is full of gifts, if you open your heart and spirit to them. Prosperity is as a much a state of mind as it is the state of your bank account. There is abundance all around you, and people who will help you achieve your goals. If you are rooted in the earth and tuned into the glory of the world around you, it is that much more likely that you too will blossom and grow. Be the Queen of your own domain, but rule with love and an open heart. Things to consider – Do you appreciate the riches in your life, whatever form they take? Are you open to new opportunities? Are you fully present in your own life? How can you make the most of the possibilities available to you now, and how can you prepare for any new possibilities that lie ahead? Embrace your own power without fear. Be open to help from others who are willing to work for your benefit. Remember that prosperity doesn’t have to mean money. Underneath caption: Are you resting, or retreating? We all need to pull back from the world from time to time; take a break, catch our breath, and regroup. The trick is to know the difference between the lack of movement that is positive and beneficial, and the lack of movement that means we are stuck, in a state of suspended animation. Things to consider: Depending on where this card falls in a reading, it may be a suggestion that you need to rest and refresh your spirit, giving yourself the time and space to renew body, mind, and spirit. Alternately, it may indicate that you are stuck in a rut, spinning your wheels when you should be taking action. Are you tired and overwhelmed? Or are you running away from making the tough choices or taking decisive action that you know is needed. Is there someone in your life who is holding you back, or whose lack of action has a negative effect on your current circumstances? This card indicates that they are stuck, and probably not going to change. Do you need a rest or a wake-up call? 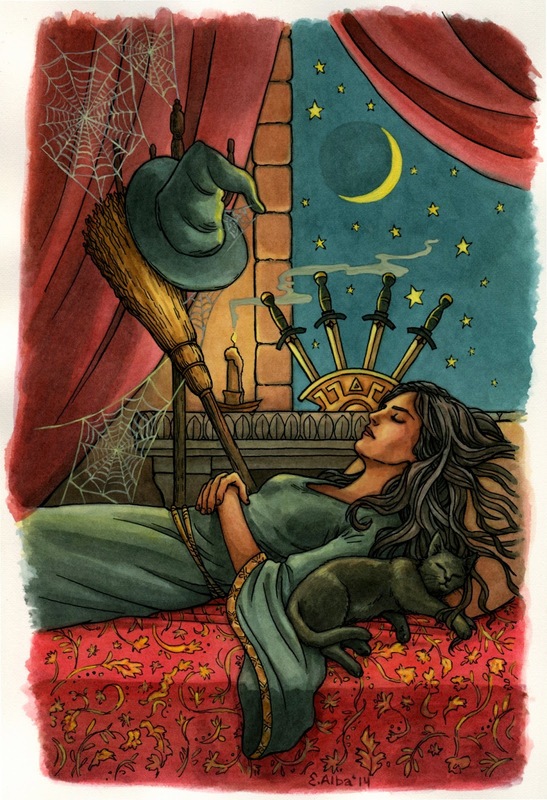 As you can see, we are using lots of traditional imagery, like black hats, and brooms, and black cats. I'm having a blast working on this project, and I'm so glad I can finally share it with all of you! What do you think? The fall or autumnal equinox, known as Mabon on the Pagan Wheel of the Year, starts today, Monday the 22nd at 10:29 EDT. Many calendars show it tomorrow, the 23rd, in part because of the difference in time zones Why fall begins Monday. (In fact, my Llewellyn calendar says it is today, my cute cat calendar says tomorrow.) It doesn't really matter when you celebrate, though. Blue Moon Circle got together yesterday. 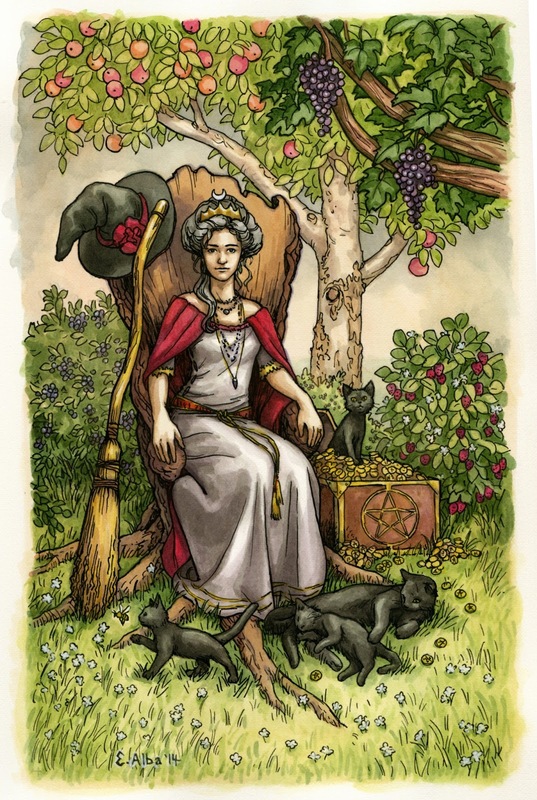 Cider in the chalice, ginger cookies & homemade bread & fresh tomatoes--it must be Mabon! What does matter is that once again, we are shifting gears; moving from the long bright days of summer to the more measured pace of autumn. Things aren't necessarily obviously slower yet, as we still have to finish the harvest (whether actual or metaphorical), but we can tell the things are winding down. On the equinox, the darkness and light are equal, so this makes the day the perfect time to do some magickal work for balance. Who couldn't use more of that in their lives? Here is a spell for balance from my book, EVERYDAY WITCH A TO Z SPELLBOOK (Llewellyn, 2010). Note: Since this is a spell for balance, make sure your altar is set up in a balanced way. Start by visualizing the imbalances in your life or a particular situation (too much work or stress, not enough love) and picture them being balanced out by whatever you are lacking. If you are too overwhelmed to even figure out what you need, just feel yourself opening up to whatever the gods send in response to your prayer. Then light the dark and light candles. In the meanwhile, I have a few other bits of good news. I found out from my agent (who found out from my editor) that Wickedly Dangerous hit Barnes and Nobles romance mass market bestseller list for the last two weeks in a row, topping out at #5 last week! Can I get a WOOT!? It is open to USA and Canada residents, so if you haven't already bought the book (WHAT??? ), go ahead and enter! Sometimes it is hard to remember that I have a life outside publishing...but now that Wickedly Dangerous is out in the world and managing more-or-less on its own, I am taking a brief break from writing to catch up with my OTHER side job, jewelry making. Snowflake Obsidian stars--an unusual stone I can't often get, but I love it! What do you think? Do you have a favorite?